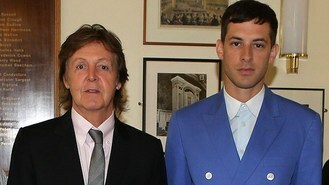 Sir Paul McCartney has revealed he was keen to team up with producer Mark Ronson on his new album after being impressed by his musical taste when he DJed at the ex-Beatles star's wedding. Ronson - famed for his work with Amy Winehouse - is one of four leading studio wizards who have shared production duties on the forthcoming album, called New, which is out next month. Sir Paul revealed the names of the 12 songs which make up the album today, including a track called Early Days, which is thought to have been inspired by his friendship with former bandmate and songwriting partner John Lennon when they first began working together. Ronson has worked on two of the songs, including the title track - which is his new single - and Alligator. Sir Paul said: "He had DJed at my and Nancy's wedding. We were dancing til 3am to his music, so I knew I liked his taste and that he's a good guy. So when the chance to work together came up, we took it. The album producers also include Giles Martin - son of Sir George who worked with The Beatles throughout their career - and Ethan Johns, son of Glynn, who worked on the Fab Four's Let It Be. "All the hot producers seem to be the age of the sons of my contemporaries. Like their dads, they're great guys who are serious about they do. They had a lot to live up to, but they all proved themselves," said Sir Paul. He has also collaborated on two tracks with Paul Epworth, who was a co-writer and producer of Adele's 21 album. New, out on October 14, is Sir Paul's first new album of solo material since 2007's Memory Almost Full. His other recent releases have been a collection of standards, Kisses On The Bottom, and his album with Youth, 2008's Electric Arguments, which was released under the name The Fireman. He said: "It's funny, when I play people the album they're surprised it's me. A lot of the tracks are quite varied and not necessarily in a style you'd recognise as mine. I didn't want it to all sound the same."